Hi, I need to create a short fence (3000mm length by 1200 high) which will sit on top of a short brick wall. Well, if the metal fittings I got to screw on the wall do not pop the bricks. The fence will be similar to this photograph. Would you suggest any trickery to protect the bottom of the 75x75 posts that will be in these post fittings? I intend to fit horizontal rails on either side of the posts and then the verticals one on either side with a small overlap. Depending on the thickness of the horizontal planks I might have 40mm total thickness (or 36mm at worse). Do I use 30 or 35mm screws? I really do not want them to protrude on the other side, there may be children next door at some point whilst I would like the vertical planks to stay on for a while. I will try and post dimensions and possibly photos tomorrow. But you are picking on the concern that i have not expressed ... the wall either holds or doesn't. Let's assume the brickwork is solid and fixings are fine. Back to the original question of protecting the post ends. First drill a hole into the end grain of the post roughly in the centre , and stand it in a bucket of preservative for as long as possible. When it comes to putting the fence up screw a coach bolt into that hole ( by now you should have worked out size of hole is dependent on the bolt size) leaving say an inch projecting. This will leave a small gap under the post which should stop it sitting in water and hopefully extend it's life as long as possible. As it's a "hit and miss fence" the wind loadings won't be such a big issue, but do check for any covenants on the deeds regards maximum fence/wall heights. The post fixings need to be fixed using Rawlbolts or the like. The ends on the fence posts should be drilled and soaked in creosote (if you can get it) or alternatively dipped in hot pitch. I did a job like this 16 years ago (8 x 6ft hit and miss on top of a retaining wall - it did require planning permission BTW). It's still there with no signs of rot at the bottom - they were pitch dipped legs. Hold your horses ... photos on phone, football on TV, 1 beer finished wondering if I should have medicinal red next 'ick. Medicinal Red it is. The fence in question is at the back of the house and everyone but me (on my garden that borders the same property) seems to have put fencing panels up. If the house next door changes hands handsaw and circular saw will adjust the height of the fence Apart from two more panels put up by the same neighbour (he passed away 2-3 years ago) the rest of the "fence" is wire fencing. The original "fence" was the white railing as the level next door is some 600mm higher (more before the patio was built and that is before my time). The next door neighbour at some point added the panels supported left and right and leaning on the railing for the rest. All I am looking is to stop people falling over, provide some privacy both ways (fine if they want to put their head over the fence and talk) and make it last as long as possible. Thank you for the comments last night ... you made me stop and think. The span from the house to the end of the wall is 3 metres. The plan now is to gain more access to the left of the wall and put a spike or concrete a post foot in the ground after the wall. Another post will be fixed against the house so I will only use the brick partition wall for 1 support in the middle (or 2 or 3 as I got too many spares and even more spare bolts think before you buy ). The dimensions of the brick wall and the bricks themselves do not inspire me with confidence. If anyone recognises what the bricks are and how strong they are please say so. The bolt (12x100) has a shaft of 9.3mm so I need to either drill a 9 or a 10mm hole (I understood I need 10mm as in 2mm less). But I only have 40mm or so to the edge of the brick . Next door neighbour suggested I use the holes inside the foot ... it is clever option and will automatically help keep the post off the ground. Funnily enough I've just done a similar job this week. Retaining wall around navel height upon which I sat a run of posts , spindles and handrail to place the pigs ear of a job that had been done previously . Method I used was to use 16mm stainless allthread screwed up into the posts and resined into the brickwork thus leaving no visible fixings in contrast to the screws and fisher fixings on show originally . Customer was very pleased. At the risk of sounding thick , i don't think I quite understand that bit. It almost sounds as if you want to bring the fence inside so you can paint it and enjoy inhaling the fumes????? Ah , turps and creosote sniffing , understood. If the fence is going to be similar to this photograph. 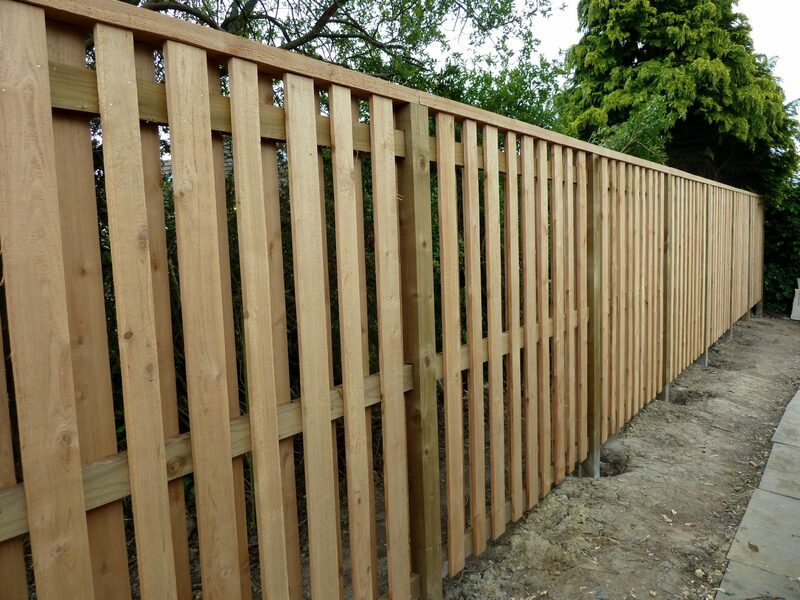 I thought to run two pairs of planks either side of the posts 100mm x20mm thick along the length of the fence (3 metres length). Neighbour up the road also a joiner but he was in a hurry said, we use 35mm so the nails can grip. I will not be using nails so gripping is not an issue. But if I wanted to run a single 35mm wide by whatever height piece of wood in-between the posts how can I connect it to the posts which are 75mm square. I have a hand router and although it would be nice to find an excuse to use it, I do not want to remove half the thickness of the posts to create a slot for the horizontal plank. Use angle brackets but the whole weight of each span would be supported by 4 brackets and maybe 12 screws?